Catherine (Deborah Walley) finds herself going into labor during a trip with Mark (Michael Cole), they take a charter flight piloted by Tony (Johnny Desmond) to the nearest hospital. The trio pass through an unusual storm before landing in a town that seems to be a mishmash of eras. The inhabitants act like robots repeating the same phrase and going through the same motions over and over again. Occasionally, everyone will pause when a huge shadow passes overhead. The three soon discover there is an impenetrable clear bubble around the town. Downtown Lincoln, Nebraska on a non-game day. On the surface, The Bubble seems to offer a Twillight Zone-lite scenario. The dialogue is corny, and an early scene involving a floating tray does not inspire confidence. Just underneath this silly veneer, there is something much weirder and darker. The film keeps its big threat off screen offering only glimpses of a massive black shadow. There is a surprisingly squishy organic nature to much of the alien presence. The comedic opening feels like a complete set-up, especially by the third act when our romantic leads are contemplating infanticide rather than leave their newborn in the clutches of an unseen tormentor. I was very pleased to see that there are no easy solutions offered, most films would offer some kind of last minute solution that would return everything to status quo, The Bubble is not interested in the status quo. 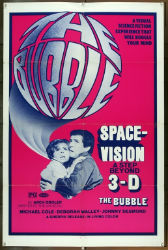 The film was originally shot in 3D, or “Space-Vision” as director, Obler, informs the audience before the film starts. It was a process that allowed shooting 3D in a Cinemascope ratio with an ordinary film camera that was fitted with an optical device. It's filled with now cliched moments of characters deliberately and repeatedly shoving things at the camera, and occasional cuts to characters looking directly into the camera and pointing. If feels distracting and unnatural. Sometimes it serves to heighten the eeriness, more often it's just annoying. The film was released with in a 122 minute version, but was later cut for a 91 minute re-release, most of the excised footage were scenes of things being shoved a the camera. Now that's a kidney stone! It's obviously a low budget production, complete with cheap looking rubber masks, and visible threads holding up floating objects. That doesn't stop The Bubble from attempting some large scale effects, including hoisting a flaming truck into the air, and scenes of people being pulled up into darkness. Its not always successful, but I appreciate the effort. The Bubble doesn't have much of a plot, characters have little way to understand their predicament and even less opportunity to do much about it. At about the hour mark there a long stretch of padding, before the films snaps back into focus. The acting never achieves more than tolerable. Still there is potent strangeness that evokes some remarkable moments. The Bubble is a truly strange film and it is definitely worth looking past its flaws to find something much darker than its initial appearance.